This is key: I mean anything that comes nicely wrapped, preserved or frozen that is ready for you to just pop open and eat. You pay a lot more for prepared foods, than if you buy the raw ingredients and make it yourself. For instance, you can buy a box of energy, breakfast granola bars for $5 a box. The box contains say 5 bars. Do you know how easy these bars are to make? Google it and you’ll have a recipe in less than 2 seconds. You can buy flour, sugar, protein powder, honey, chocolate chips, granola and what ever else you want to throw in all for less than $10. But you can make 100 bars with these ingredients. Sure it takes a few minutes of your time, but you can do something else while the bars are baking and you can make a whole tray of bars that you can store in plastic bags for later. Anything in the store you can buy prepackaged you can make yourself for a mere fraction of the cost. It’s not that hard either – it just takes a little bit of skill and a minimal amount of time. The best part is that anything you make yourself is also probably healthier than what you can buy prepackaged, since what you make will not contain preservatives. 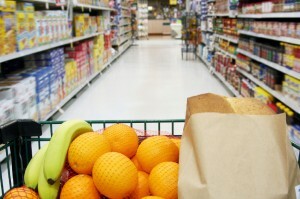 Diet food products cost more money for less calories. This is a waste of money, so long as you can just eat less calorie dense foods as part of diet to lose weight. Meat is expensive and Americans eat far too much of it anyways. At least two nights a week I make a vegetarian dish such as spinach quiche, bean burritos or pasta with veggies. These meals cost end up costing under $5 for a family of four. Exotic fruits and vegetables that are not in season and not local to your area are very expensive. They’ve also been transported from afar and are not as fresh. This is obvious. Before every shopping trip I spend 5 minutes at the door review the flyer that lists the specials that week and take any good coupons with me. However, do not buy prepackaged goods on special, since they will still cost you way more than buying the raw ingredients at full price. When I check out my cart is full of in season vegetables that are on special, just a few packs of meat that are on special and pasta and rice for dinners. For breakfasts I have rolled oats (about $2 for a month’s worth), eggs and in season fruits. For lunches there is bread, cheese, peanut butter, jelly and sometimes deli meat if it’s a really good deal. Other than that I just buy milk and yogurt, and baking ingredients if I am running low. You’d be amazed at how little this totals up to, mainly because I have left behind expensive boxes of cereal, pop tarts, cookies, frozen dinners, potato chips, etc. I can easily whip up brownies or cookies with the raw ingredients I always have on hand, make fries from real potatoes, etc. Jessica Drew is a freelance writer and editor who blogs about a variety of money making and frugal living topics such as credit cards. The prepackaging safety is awesome and fluently exerted in the post. The post is totally conscious people about higenic foods just like vegetarian in a week twice which is so much important and many other good suggestion. I like it most. Thanks. to be far a lot more unpleasant of one’s privacy. use your Zune with your Mac computer.